Whether you move your add-on icons to the top, bottom, or side of your browser, the point is you have options. Take the functionality of browser extensions and add-ons one step further by controlling where those icons show up in your browser window. 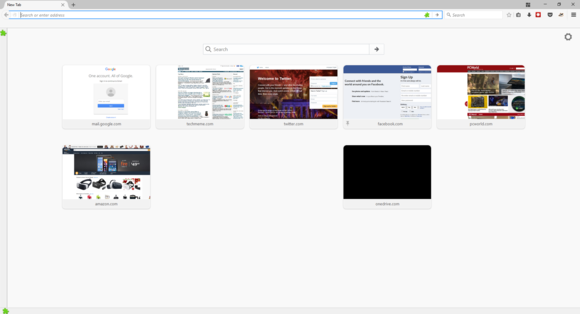 A Firefox add-on called Puzzle Bars lets you place your add-ons and several built-in browser icons nearly anywhere you want. The convention is for add-on icons to reside at the right of the address bar, but if you have a lot of them, they won't all be in plain sight. Having control over your add-on icons' location can make it easier to see what's available and to quickly access a particular add-on when you need it—to, say, adjust a setting, reveal information (like with a password manager), or activate a feature (such as saving a web page to Pocket). As an example, let's say I want to stash all of my add-on icons inside the location bar (also known as the address bar). That's not so different from the default, but I can place as many icons as I like there, particularly if I'm using a large-screen monitor, so it makes it easier to see what I've got installed. Plus, when I'm using the location bar I can simply hide all the icons in order to see the full URL of the website I'm visiting. If you don't like the idea of placing your add-ons in the address bar—say you have way too many to make that location practical—you can also choose a lateral sidebar on either the left or the right; a bottom toolbar; a toolbar at the top similar to a bookmarks bar; or one in the lower right-hand corner. If you wanted, you could even throw all your extension icons under the "hamburger" menu icon with the rest of Firefox's menu options, for a more minimalist look. Or you could use a combination of all of the above. Puzzle Bars offers several places where you can stash your add-on icons, which appear as toolbars around your browser window. To start, install Puzzle Bars from the Firefox add-ons catalog. Once that's done, you should see several new toolbars, called puzzle bars, surrounding your browser. Most noticeably there will be one at the bottom and one on the left side. To get rid of any puzzle bars, all you have to do is click on the green puzzle icon. If you ever want them back, you can right-click the green puzzle piece in the address bar and select the puzzle bar you want to re-appear from the context menu. Returning to my example of putting all my add-on icons in the location bar, here's how to do it. Right-click each add-on icon in the toolbar to the right of the address bar and select Move to Location Bar Puzzle Bar. Repeat this process for each add-on. All add-on icons are in the address bar thanks to Puzzle Bars. That's it. When you're done, your browser should look similar to what you see here. For one final tweak, type about:puzzlebars#uRLBar into Firefox's location bar. Then check off Hide only when the location bar has focus. That way you'll always see your add-on icons except when you're using the URL bar to enter or copy a URL.